Same-day Appliances Delivery is Now Available! Buying new appliances from SM Appliance but worried that you will not be able to enjoy them because of standard delivery schedules? Worry no more! Same-day delivery is now available! Now, with Transportify’s on-demand courier and delivery services, buyers can take their appliances home on the same day they bought their fridge, oven, or. television from the store! Filipinos are excited to bring home their appliances after the purchase. The Transportify app can now be used to book deliveries for SM Appliance Center items. 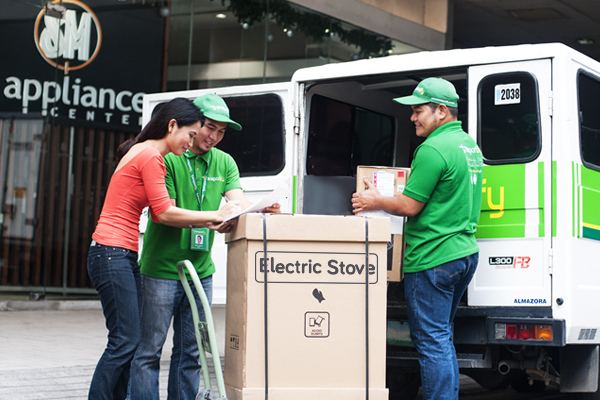 This third-party logistics or 3PL service from Transportify is available to several SM Appliance branches within the Transportify service area such as SM North, SM Marikina, SM Sta. Mesa, SM Bacoor, and SM Cubao! Simply download and install the Transportify mobile app for free, and launch it while making sure you have a strong mobile data or WiFi connection. Enter the appliances’ store address as the pickup point and your home address as the drop-off destination and you will see the number of available Transportify vehicles in the area. You can then select the type of delivery vehicle you need for the appliances you bought and schedule your timing preference. Keep in mind that your pickup time preference must be no less than 60 minutes from the time of booking so the Transportify delivery driver partner will have enough time to travel from his current location to the pickup point. Once the destination, vehicle type, and schedule have been selected, the Transportify app will then match you with a driver in about a minute. The app will also provide you the driver and vehicle’s details like name, contact number, and plate number. You will also receive the driver’s estimated time of arrival at the pickup point. 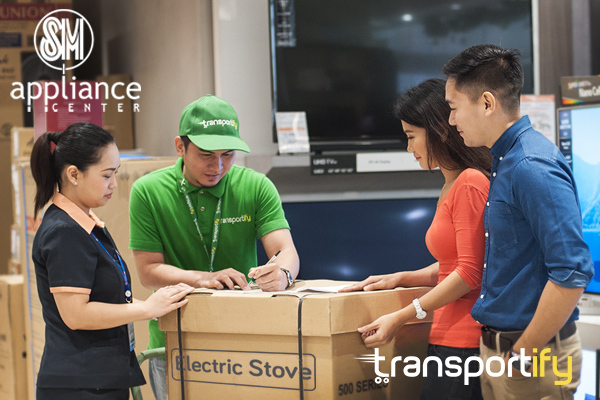 Shopping at SM Appliance Centers and appliances delivery in the Philippines is now easier and faster with the Transportify app and its affordable shipping prices complete with customizable extra service features. Download our mobile app now and enjoy your appliances on the same day you bought them from the store! Want to know more about Transportify? Watch Transportify in Bloomberg TV Philippines’ Bright Ideas with host RJ Ledesma. 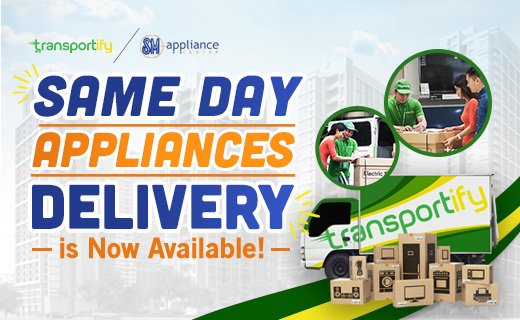 You can now use the Transportify app to book same-day delivery services for SM Appliance Center items from several branches within the Transportify service area such as SM North, SM Marikina, SM Sta. Mesa, SM Bacoor, and SM Cubao!